We enlisted the help of 10 different fitness experts who gave their ultimate stetch for guys—plus, how, why, and when to do ’em. These run the gamut from early-morning-I’m-still-in-bed stretches to pre-workout warmups, midday muscle relaxers to post-workout stiffness alleviators. With a stretch targeting every main muscle group, you can take your pick, or incorporate them all to drastically improve your flexibility, relieve commuting aches, and effectively loosen stubborn knots. You’ve got nothing to lose, and a breadth of benefits to gain. How to do it: Lower down onto your knees. Lift your left knee so it’s bent at a 90-degree angle and directly below your knee, planting your foot on the floor. Exhale and lean forward until you feel the stretch in your upper thigh and hip flexors. Your right knee and toes should be in contact with the floor throughout the entire stretch. Use your abdominal muscles to keep your back straight and your spine supported. Hold the stretch for 30 seconds. Come back to the starting position, and complete the stretch on your opposite side. What it does: “By engaging your glutes, you can stretch your psoas muscles (hip flexors), which is hugely important for people who sit most of the time or have frequent back pain,” says Nick Rodocoy, P.T. When to do it: It’s always best to do this stretch when your muscles are warm, like right after a workout, or when you get out of the shower. How to do it: While standing, hinge at your hips and reach down toward your toes, keeping your legs straight. “If you can’t reach the floor, bend your knees just enough so you can,” suggests Albert Matheny, R.D., P.T. of SoHo Strength Lab. As soon as your hands touch the floor, alternately walk them forward until you’re in a pushup position. Your legs should be straight and at the same height as your head, shoulders, and hips. Begin to walk your hands back toward your feet while pushing your hips in the air, driving your heels into the floor (think about mimicking an inchworm). Keep your legs straight for as long as you can to really get into the stretch. Return to standing position and repeat for 10 reps.
What it does: Targets your hamstrings, calves, and lower back, improving flexibility and blood flow. When to do it: This is a great way to start your day or any workout. How to do it: Stand with your feet hip-width apart. Raise your left hand up and over your head and keep your right hand down by your side. Engage your abdominals (like you’re pulling your belly button in toward your spine) and bend at the waist toward your right side, lowering your right arm toward the floor as you go. Pause for a few seconds, then slowly come back to the start position. Repeat on the other side. Complete 10 reps on each side. What it does: “This stretch is incredibly important because it warms up and preps the serratus (the muscle that looks like fingers pointing from your ribs to your abs) for dynamic actions like throwing or punching,” says Kathryn Budig, yoga teacher, author and Under Armour spokesperson. 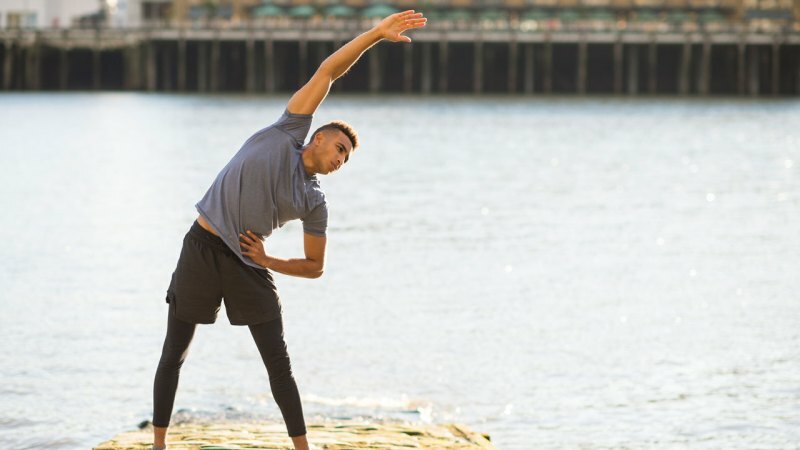 When to do it: Aside from prep for dynamic moves, it should be done on a regular basis throughout the day to help you breathe better and stand taller. How to do it: While lying in bed, or on the floor, pull your knees to your chest. Then, lift your legs straight up into the air and, while they’re extended, lower them down to your left side, holding the stretch for 10 seconds. Bring them back up into the air, and lower them down to your right side, again, holding for 10 seconds. What it does: This helps to stretch out the back and loosen up any knots from sleeping. When to do it: “I like to do it first thing in the morning, while still in bed, or before a workout to loosen up the lower back and get the blood flowing,” says fitness and wellness expert David Kirsch. How to do it: Lie down on your back, bend your knees, and lift your feet up so your legs are at 90-degree angles and the bottoms of your feet are parallel to the ceiling. Your knees should be directly over your hips, and your ankles should be over your knees. Grab onto your feet (if you need more support, grab your ankles), and press your lower back firmly into the floor. Draw your knees down toward the floor to deepen the stretch. Relax your shoulders, and keep your head and neck down on the floor. Hold for a minimum of 10 breaths (smooth, slow conscious breaths in and out through the nose). The longer you hold, the better. When to do it: You can do this stretch first thing in the morning when you wake up, pre-workout, or post-workout, too. How to do it: Stand tall and raise your arms so they’re parallel to the floor. Pick your chest up to extend your spine, and externally rotate your shoulders by pointing your thumbs behind you (so your palms are facing up). “Keep your head and neck in a neutral or packed position,” says exercise physiologist Felix Bangkuai, P.T. “It should resemble a double-chin.” Hold this position for 3 seconds and repeat 5-10 times. What it does: This stretches the pectoral and anterior deltoid muscles, and externally rotates your shoulders, preventing them from being too internally rotated. This happens if you have poor posture (you’re slumped over a computer all day), have tight pecs, lats, or traps, or any weaknesses in your back. It causes your shoulders to pull forward, out of their normal position, which strains your humeris and triggers a chain reaction down your body. When to do it: Do this stretch throughout the day—especially if you’re glued to your desk for extended periods of time. How to do it: While lying on the floor, place a cable, band, or towel around the bottom of your left foot, holding onto either end with both hands. Using the cable, band, or towel to aid you, raise your left leg to about 90 degrees, keeping your right leg straight on the floor, or bent at the knee. Hold this for a few seconds, then contract your quad and push against the stretch without actually moving, and hold this contraction for six seconds. This triggers a “hold-relax” reflex, which will allow you to go beyond the normal stretch. Relax, then pull your leg further into the stretched position—it should be deeper than the first. Hold this for an additional 10 seconds. When to do it: Pre-workout and on a regular basis to improve flexibility. How to do it: Begin by lying on the floor or mat flat on your back. Cross your right ankle over your left knee, forming the backward shape of the number four. Hold your left thigh with both hands (your right hand will thread in between your legs, rather than rest on the outside of your right leg). Bend your left leg, pulling it in toward your chest (it shouldn’t be uncomfortable). Flex both feet to protect your joints. Hold for 30 seconds to a minute, then repeat on the opposite side. What it does: “This stretch will ease any lower back soreness and help relieve tight hamstrings and glutes as well,” says Alyssa Ages, P.T. When to do it: This is great for anyone who’s been stuck in the office or commuting all day and has back pain, or if you’ve done a leg-centric workout at the gym (like squats and deadlifts) and want to alleviate any soreness. How to do it: Come into a seated position with good posture. Gently bend your left ear towards your left shoulder until you feel a stretch in the right side of your neck. To intensify the stretch, rest your right hand on the floor, and walk those fingers away from your body. You’ll feel a deeper stretch throughout the trapezius muscle, which extends over the back of your neck and shoulders. Or, place your entire left palm against the right side of your face, so the fingers reach just below your earlobe. Use gravity or gentle pressure to bend your neck further into the stretch. Hold at a comfortable range for 15-20 seconds, then repeat to the right. Repeat 3 times per side. When to do it: Whenever you’re experiencing back or neck stiffness. If you have a long daily commute, or a job that keeps you at a desk, do this stretch every other hour, or four times in an eight-hour shift. How to do it: Lie down on a bench (with a light weight in each hand—2 to 5lbs). Gently press your lower back into the bench as you stretch your arms out at shoulder-level with your palms facing up. Let gravity or the light dumbbells slowly stretch your chest and biceps. Hold this for 30 seconds, and repeat 2-3 more times. “You may have to adjust your arms to find the stretch across your chest,” says Karma Yoga & Fitness instructor Megan Hochheimer. What it does: Loosens any tightness in your pecs and gets the blood flowing throughout your chest and arms. When to do it: Pre-workout or post-workout to alleviate soreness, or open up your chest.